Mayan Genesis and Inca Origins author Kearsley examines the evidence for Asian migrations through Africa and their relationship to the Asian cultures in the Americas. Chapters include: The Great Fertile Crescent, Climate Change and Migration; Desertification and Dispersal Throughout the Greater Fertile Crescent; Ethiopia and Migrations in Africa; Evidence of Archaeology and Metallurgy in East Africa; Ancient Incursions into East Africa from India and Indonesia; Zimbabwe—A Trail of Gold from Mozambique by way of Sofala; A New Archeological Age at Zimbabwe; The Moon, Mountains, and Cultural Transfer from Asia; Later Transfers of Polynesian and Indonesian Customs in Africa; Ritual and Artefactual Transfers from South Asia and Oceania; Iron Before Bronze—Metallurgy in African Traditions; Serpent Slayers, the Savannah and Blacksmiths; Ironworking Traditions—From Dogon to the Ammuru in Africa; Traditions of Pygmoids and Dwarfs in Asia, Africa and the Americas; The Equatorial Extension of Tiki and Related Myths Worldwide; more. A massive book packed with illustrations and rare information. Imported from Britain. 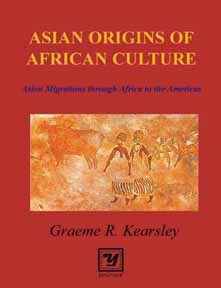 ASIAN ORIGINS OF AFRICAN CULTURE: Asian Migrations through Africa to the Americas By Graeme R. Kearsley, 895 Pages. 7x9 Paperback. Illustrated. Glossary. Bibliography. Index.